Benchmarking your data against either internal or external parties that have measured the same variables as your own can be an incredibly powerful way to shine greater perspective and insight on your decision making process. 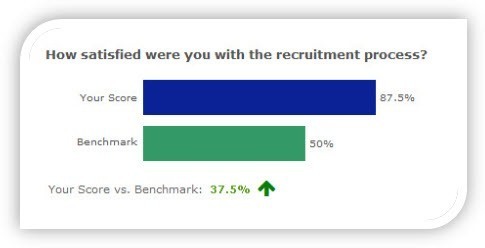 PeoplePulse can help with such benchmarking requirements. If you have a common set of questions that more than one group are measuring against, and these groups are interested to compare how they stack up against each other, then PeoplePulse’s benchmarking solutions can assist. Brief description: For when you have one survey within one PeoplePulse account, and have multiple groups or demographics completing the same survey. PeoplePulse offers an extensive online reporting console that enables you to easily compare the results for each group, sort the results by variances, and easily create charts and graphs. You can even share emailed reports with all stakeholders that lock reports down to show you a cumulative view of ALL results side by side with a locked view of one specific sub-set of the data (eg. a division or geographic location). Example of an Internal Benchmarking survey: The Asia Pacific regional HR Director wants to compare Staff Engagement levels of 14 different countries side by side in the same report for board presentations. But at the same time she wants to be able to share a locked down country-specific report with each country manager that shows that county’s specific results against the cumulative results of all countries. Brief description: For when you have multiple surveys within one PeoplePulse account, but each survey has a component of common questions that you want to be able to easily combine and compare from one aggregated report. PeoplePulse has a unique ‘master aggregate’ feature that is built specially for this purpose. In short, we can combine the results for the same question in different surveys into one master report. This report can be filtered, emailed, exported to Word/Excel, or printed – and it compiles results in real time, saving you an incredible amount of time when compared to the ‘old school’ approach of manually combining data from different surveys. Example of an Internal Benchmarking survey that uses Master Aggregate reporting: The Manager of Customer Insights wants to create a Voice of Customer program. He wants to build 8 distinct customer surveys, all sent at different touch points on the customer’s journey, but also include the Net Promoter Score (NPS) question in each survey and be able to report on the aggregated NPS results from one place. Brief description: For when you have a standard question or set of questions that different organisations have completed, and you want to be able to compare how you measure up against the cumulative results of all organisations that have participated in the benchmark. Example of external benchmarking: The General Manager of a local council wants to compare his resident satisfaction scores with all other local councils that have participated in the resident satisfaction score benchmark survey both in his region and across the country. If you would like to discuss your options regarding any benchmarking related survey project you might be considering, then we’d love to chat. Please either email us using the form below, or phone us on +61 2 9232 0172. Our Project Managers have extensive experience in the set up and delivery of best in class survey solutions. We make it easy for you to get set up in no time. The PeoplePulse solution treats all responses with the utmost respect and confidentiality. All data is stored securely and held on secure 256bit encrypted servers. We look forward to the opportunity to assist you too.